Pre-view is available here. French version of the book is also available on request (please make a note if you would like the book in French when you order it). The “Inventor’s Manual” is your first step on the long and interesting road of learning the theory and practice of invention. This manual is specially designed to help you make the process of creativity and problem-solving logical, systematic and rational, thus increasing the efficiency of your thinking. Unlike other books that talk about innovation, our Manual tells you what to do and how to do it in order to achieve the best result faster. Unlike other books on innovation it is … thin and manageable. It is a lesson with visual appeal, making use of pictures, diagrams and striking examples. This manual can also be helpful for professional trouble-shooters due to its “tick-box” and procedure-like style. 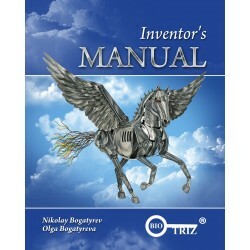 The algorithms of the Inventor’s Manual are based on a Theory of Inventive Problem Solving (known by its Russian acronym TRIZ), which is a highly adaptable and overarching methodology. But you do not need to know TRIZ to be able to use the Inventor’s Manual. Different tools that may assist you in the process of problem solving can be learnt and used later where, when and if they are needed. Templates for thorough reflection on the context of a product design that are not explicitly presented in TRIZ at all, but which are a very important system thinking aid especially if you are dealing with complex engineering or social system. You will find the influence of natural rules for dealing with resources, complexities and ways to avoid problems that are not present in ordinary TRIZ methods. Enjoy your own natural problem-solving talent following the Inventor’s Manual!